Learn about the formation of the rocks of Ben Nevis, a deeply eroded caldera volcano active 420 million years ago. 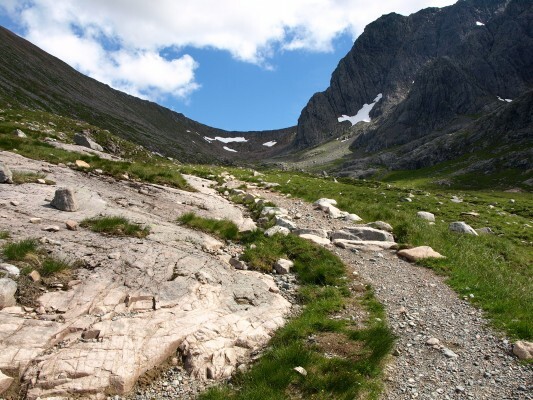 Discover the ‘classic’ British Geological Survey’s Ben Nevis evolution. Be told of the recent, controversial research that suggests that the lavas did not descend from above into a caldera. Involves walking for a full day. There is a path most of the way, it is steep in places and rocky at the top. This path up to the North Face is relatively unused compared with the main walker’s path up Ben Nevis which lies to the South-west. Please be prepared for Scottish west coast weather. See our clothing and equipment page for more information. Cost and Booking: 1 person £100 with a second person going free on the same booking. Extra persons on the same booking charged at 50% off, i.e £50 per person with a maximum of 8. Families (2 adults, up to 3 children): kids go free, just book adults in and let us know that children are coming.